A Brookline, Massachusetts, firefighter accused of beating a man who took too long to order food from a popular taqueria Sunday night has been arrested and placed on administrative leave. Joseph Ward, 37, of Dorchester, appeared in court Tuesday morning to answer to charges of assault and battery. He was released from custody on personal recognizance. "I've never seen unbridled anger like that in my life," said 53-year-old Jeffrey Gagnon. Gagnon says he feels lucky to be alive after he says he was assaulted outside Anna's Taqueria in Brookline Sunday night by a man later identified as Ward. According to a police report, Ward was in line waiting to order at the taqueria and asked the customer in front of him to hurry up. The Brookline Board of Selectman has voted to fire firefighter Joseph Ward III, who has pleaded not guilty to charges that he allegedly beat Jeffrey Gagnon and threw a bottle and burrito at him on Oct. 11 at Anna's Taqueria. "The guy hit me with a bottle and then he was on the ground pounding me," Gagnon said. Words were exchanged, then Ward followed the man outside and called him "a homeless (expletive)," according to the report. 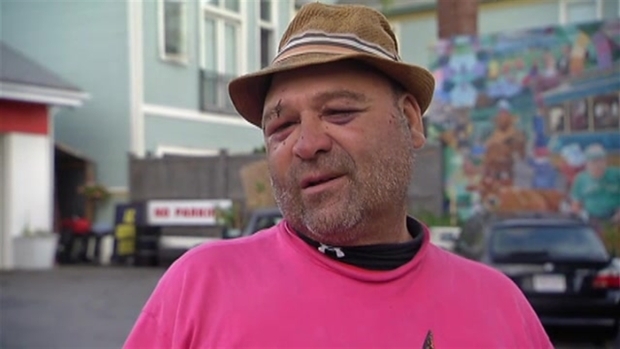 Gagnon says he's not homeless and he didn't hear the insults. He said the line was so slow he left without food, and that's when he says Ward came outside and attacked him from behind. "As I was leaving that, he hit me in the head, brought me down on the ground, started hitting me, straddling me and then he threw a burrito at me that he ordered and waited so long for that he got so mad about," Gagnon said. Prosecutors say there is surveillance video from outside the taqueria corroborating Gagnon's claims, but Ward's defense attorney stressed that only shows half the story. "Which is why I requested some evidence from inside that restaurant where we believe that the altercation started," said Ward's defense attorney, Benjamin Urbelis. Gagnon says he got stitches and his face is fractured in three places, but he feels lucky it wasn't worse. "I was like this could be it man, this could be it," Gagnon said. Ward was released on his own recognizance and ordered to stay away from the victim and witnesses. He is due back in court November 16th. Ward remains on administrative leave from the fire department pending the outcome of the investigation. The department would not specify if that was paid or unpaid leave. "As you know, Mr. Ward has been placed on administrative leave pending the investigation. I cannot provide you with anything more than that at this time as I have not been able to review the reports or speak with Mr. Ward," the chief said in a statement Monday, adding that he hoped to speak with ward Tuesday. Town Administrator Mel Kleckner said the town was also aware of Ward's arrest and declined to comment further.